Federal investigators say they will interview the pilots Saturday and look into "everything that went into making this survivable." Federal investigators looking into the emergency landing of a US Airways jetliner in the Hudson River said they will interview the pilots Saturday and look into "everything that went into making this survivable." 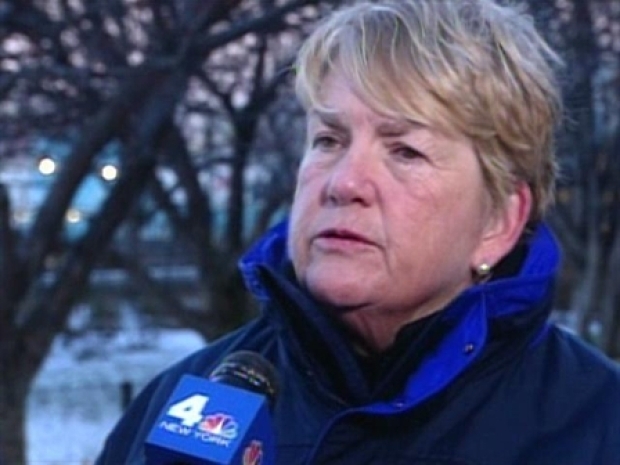 A spokeswoman for the National Transportation Board, Kitty Higgins, confirmed in a press conference Friday afternoon that both engines of the plane are no longer attached. Crews were interviewed Friday about the dramatic Thursday afternoon emergency landing, Higgins said. She said witnesses and passengers are also being interviewd. "It's very helpful to have those first hand accounts," she said. Everyone involved not only wants to "celebrate," but also "learn from what went right," she said. National Trasportaion Safety Board will interview the flight crew and air traffic control as part of its investigation into the Hudson River plane crash. Police divers were using sonar Friday to help find the engines as investigators brought in a giant crane, divers and a barge help pull the aircraft from the river. Higgins said he conditions of the water was slowing the work of recovering the data recorders. Massive waves rose up around the back of the 9-year-old Airbus A320, which had been bound for Charlotte, N.C., from LaGuardia airport when it lost power after apparently hitting birds at about 3:30 p.m. Thursday. The dramatic photo was taken with a cell phone by witness Roy Gates from the Henry Hudson Parkway. The pilot, Chesley "Sully" Sullenberger III, cooly guided the plane down into the river near the Intrepid Sea, Air and Space Museum after determining he could not land the jet at Newark or any other nearby airports. 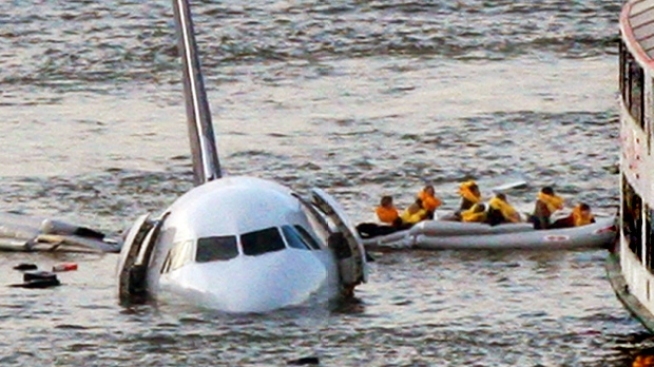 No one aboard died thanks to Sullenberger's expertise. The praise for the Sullenberger started as soon as he was on the rescue raft with the passengers he just saved with a miraculously smooth landing, survivor Billy Campbell told the "Today." "I leaned over and grabbed his arm, and I said I just want to thank you on behalf of all of is," Campbell said. "He just said, 'You're welcome.'" Sullenberger was in good spirits and showing no outward signs of stress from the ordeal, a pilots union official said. The Airbus A320, built in 1999, was tethered to a pier on the tip of Lower Manhattan on Friday morning — about 4 miles from where it touched down. Only a gray wing tip could be seen jutting out of the water near a Lower Manhattan sea wall. About a block away, it was business as usual as residents jogged or headed to work..
Higgins said one challenge will be hauling the plane out of the water without causing it to break apart. Sullenberger and co-pilot Jeff Skiles and crew have become instant heroes for guiding the plane to safety and safely evacuating the passengers. Sullenberger's wife told CNN she hadn't been watching the news and was stunned to hear about the ordeal from her husband after it was all over. "I've heard Sully say to people, 'It's rare for an airline pilot to have an incident in their career,'" Lorrie Sullenberger said. "When he called me he said, 'There's been an accident.' At first I thought it was something minor, but then he told me the circumstances and my body started shaking and I rushed to get our daughters out of school." James Ray, a spokesman for the U.S. Airline Pilots Association, said he spoke with Sullenberger on Friday and described him as being "in good shape physically, mentally and in good spirits." "He was just very calm and cool, very relaxed, just very professional," Ray said. Ray said the flight crew was resting and likely would meet with investigators later Friday or Saturday. He said the crew has been asked not talk to the press about the accident until after the NTSB investigation is complete. Sullenberger, 57, of Danville, Calif., is a former Air Force fighter pilot who has flown for US Airways for 29 years. He also runs a safety consulting firm. US Airways chief executive Doug Parker said in a statement it was premature to speculate about the cause. Federal Aviation Administration spokeswoman Laura Brown said there was no immediate indication the incident was "anything other than an accident." On his Friday morning radio show, Mayor Michael Bloomberg said the city "got away with a miracle." He planned to honor the rescuers at a City Hall ceremony later Friday. It was a chain of improbability. Birds tangle with airplanes regularly but rarely bring down commercial aircraft. Jet engines sometimes fail — but both at once? Pilots train for a range of emergencies, but few, if any, have ever successfully ditched a jet in one of the nation's busiest waterways without any life-threatening injuries. "We had a miracle on 34th Street. I believe now we have had a miracle on the Hudson," Gov. David Paterson said. If the accident was hard to imagine, so was the result: Besides one victim with two broken legs, there were no other reports of serious injuries to the 155 people aboard. "You're happy to be alive, really," 23-year-old passenger Bill Zuhoski said. US Airways Airbus A320, bound for Charlotte, N.C., took off from LaGuardia Airport at 3:26 p.m. Less than a minute later, the pilot reported a "double bird strike" and said he needed to return to LaGuardia, said Doug Church, a spokesman for the National Air Traffic Controllers Association. Passengers quickly realized something was terrifyingly wrong. "I heard an explosion, and I saw flames coming from the left wing, and I thought, 'This isn't good,'" said Dave Sanderson, 47, who was heading home to Charlotte from a business trip. "Then it was just controlled chaos. People started running up the aisle. People were getting shoved out of the way." Then came an ominous warning from the captain: "Brace for impact because we're going down," according to passenger Jeff Kolodjay, 31. Some passengers prayed. Vallie Collins, 37, tapped out a text message to her husband, Steve: "My plane is crashing." For a desperate half-hour, he was unable to get in touch with her to learn that she had survived. Onshore, from streets and office windows, witnesses watched the plane steadily descend off roughly 48th Street in midtown Manhattan. "I just thought, 'Why is it so low?' And, splash, it hit the water," said Barbara Sambriski, a researcher at The Associated Press, who watched the water landing from the news organization's high-rise office. The 150 passengers and five crew members were forced to escape as the plane quickly became submerged up to its windows in 36-degree water. Dozens stood on the aircraft's wings on a 20-degree day, one of the coldest of the winter, as commuter ferries and Coast Guard vessels converged to rescue them. One ferry, the Thomas Jefferson of the company NY Waterway, arrived within minutes. Riders grabbed life vests and rope and tossed them to plane passengers in the water. "They were cheering when we pulled up," Capt. Vincent Lombardi. "People were panicking. They said, 'Hurry up! Hurry up!'" Two police scuba divers said they pulled a woman from a lifeboat "frightened out of her mind" and lethargic from hypothermia. Helen Rodriguez, a paramedic who was among the first to arrive at the scene, said she saw one woman with two broken legs. Paramedics treated at least 78 patients, many for hypothermia, bruises and other minor injuries, fire officials said. Some of the shivering survivors were swaddled in blankets, their feet and legs soaked. Mayor Michael Bloomberg and US Airways' Parker were set to honor those who came to the aid of the passengers at a ceremony later Friday at City Hall. From 1990 to 2007, there were nearly 80,000 reported incidents of birds striking nonmilitary aircraft, about one strike for every 10,000 flights, according to the Federal Aviation Administration and the Department of Agriculture. The Hudson accident took place almost exactly 27 years after an Air Florida plane bound for Tampa crashed into the Potomac River just after takeoff from Washington National Airport, killing 78 people. Five people on that flight survived. On Dec. 20, a Continental Airlines plane veered off a runway and slid into a snowy field at Denver International Airport, injuring 38 people. That was the first major crash of a commercial airliner in the United States since Aug. 27, 2006, when 49 people were killed after a Comair jetliner took off from a Lexington, Ky., runway that was too short.